By Kim-Business, Dairy, Farm Life, Milk- No Comments. Pantry locations and a few school & church programs as well. This is a group effort that has proven to be very successful and greatly appreciated as these food pantries continue to supply food to people in need. Mary Dietz, Director of Green County Inter-Church Food Pantry in Monroe informed her group that Rolling Hills Dairy Producers Cooperative has been donating cheese like this for over 5 years. This time of year, it’s such a blessing to receive. 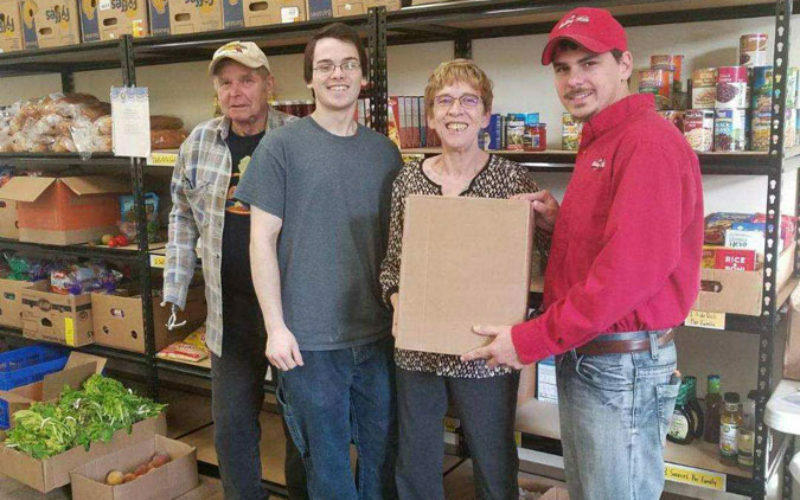 Pictured left to right Ryan Moore, field man from Rolling Hills Co-Op, Mary Dietz, Director of Green County Food Pantry, along with Kyle Campbell and Bob Ellefson.